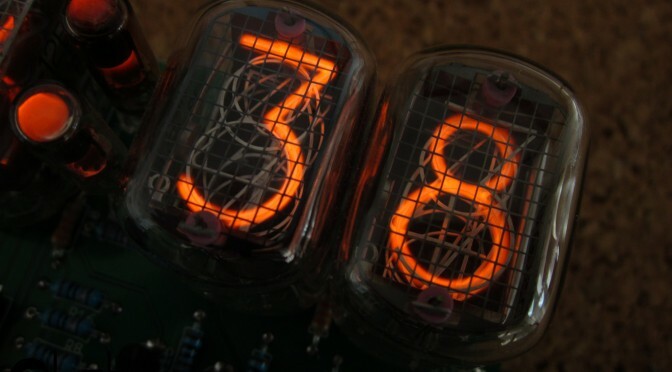 Nixie tubes are electronic devices for displaying numerals or other information, such symbols or letters. They work under the principle called Glow Discharge. Basically, they are tubes filled with a low-pressure mix of gasses and two (or more) metal electrodes. When a voltage is applied to two of this electrodes, and such voltage exceeds a certain value called the striking voltage, the gas in the tube ionizes, becoming a plasma, and begins conducting electricity, causing it to glow with a colored light (depending on the gas filling the tube, for tubes with neon this color is red-orange).